Ready for a summer of Entertainment and Leisure in Taormina ? 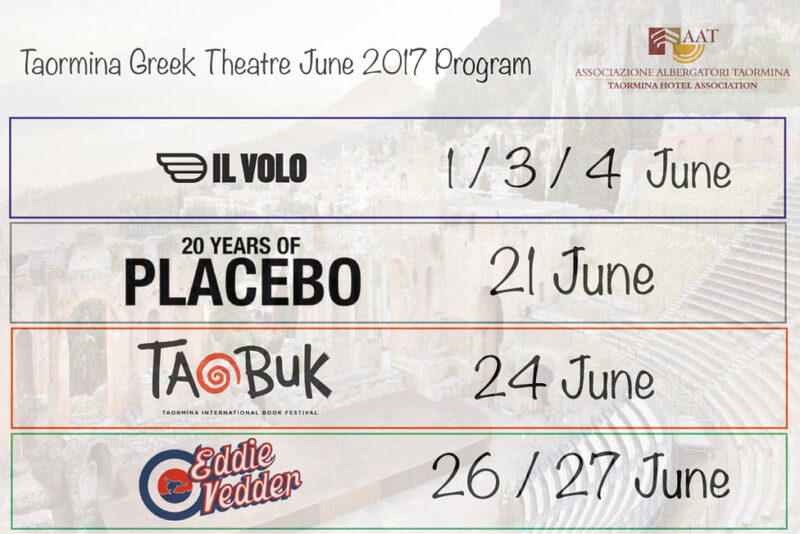 Here’s June 2017 program : starting with the three young tenors back again in Taormina but with an important update, this year as musical accompaniment they have chosen “Taormina Opera Stars” a local orchestra which has been appreciated all over Italy. The Placebo will be in concert on the 21st of June in occasion of their ” 20 years of Placebo ” tour , followed by Taobuk yearly appointment in Taormina ; the international book festival this year will see important and modern topics. To close the month Eddie Vedder in concert on the 26 and 27 of June which just after 6 hours have been sold out ! This year fun and leisure are guaranteed in Taormina !